HAIRPRINT is a brilliant scientific breakthrough that restores grey hair to its real colour. It replenishes the natural pigment (eumelanin) found in brown and black hair that has turned grey. HAIRPRINT is also an actual protein treatment that will add body, strength, texture, and sheen while reducing frizz and discolouration. HAIRPRINT odour free, simple organic formula, which is also hypoallergenic, produces colour so natural; it defies detection. This patented treatment can be applied at home in about 75-90 minutes. 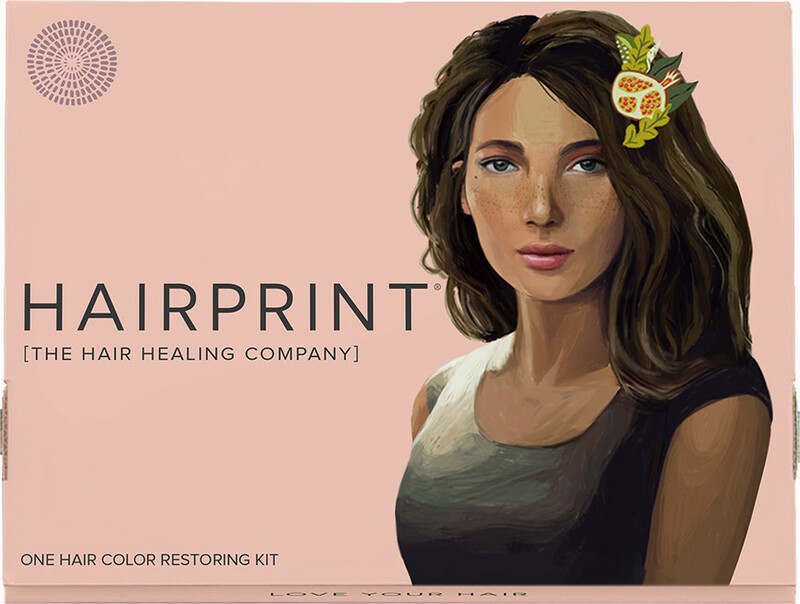 HAIRPRINT Colour Restorer works for naturally black, brown, and light brown hair only. We do not have a formula for naturally blonde or red hair. To determine what colour to order or if you need two kits for your first application, see the ordering tips /colour chart tab. If you have used hair dyes, relaxers, perms, waves, dyes, blowouts, or keratin treatments, please read our transition tips before ordering. You will need to take steps protect the processed hair and avoid having your hair go too dark. HAIRPRINT works when it has unobstructed access to the hair. We highly recommend using a clarifying shampoo or chelating shampoo on the day of application to remove any possible residue or buildup. If you have hard water or borehole water or suspect you might, we recommend our Chelating Shampoo instead of the Clarifying Shampoo. The chelating shampoo will act as a clarifying shampoo but will also remove calcification, lime, iron and other minerals that adhere to the cuticle. Most commercial and quite a few “natural” hair care products contain quaternary ammonium compounds (quats), proteins or silicones, and some shampoos contain soap that can leave a residual build up on the hair. We created a complete line of shampoos and conditioners to remove the buildup and gunk and ensure healthy, soft, clean hair and optimal results from HAIRPRINT. What are quats? These are bromine or chlorine salts of ammonia that act as anti-static agents, disinfectants 1. and algaecides. A lot of natural hair care justify quats because they contain rapeseed or turnip oil. Quats defrizz the hair, making it feel softer. However, it is the MSG of hair care: addictive and unnecessary. Quats are toxic to the fish that end up swimming in them when you wash it down the drain. What something ‘is made’ from does not matter. What it ends up as does matter. Quats coat the hair and gum up the scalp. They include cetrimonium chloride, behentrimonium chloride, and guar hydroxypropyl trim onium chloride. Healthy hair does not need synthetics. What is toxic to fish is not good for you. Avoid them. To determine your selection of HAIRPRINT No Dye Colour Restorer, compare your current natural colour, best seen at the nape of your neck, to the options on our colour chart below. If you fall in between two options on the colour chart we suggest starting with the darker colour for more consistent coverage of gray. One kit will sufficiently cover 6”-10” of growth depending on your hair thickness and porosity. If you have 50% or more gray hair,” you will need to use two kits initially following our double application method directions. Once you have successfully used HAIRPRINT on all your hair you can continue to use HAIRPRINT on your roots and new growth as needed, which only requires one kit. Root touch-ups, generally required every 3-6 weeks, can be done using half the normal recommended amounts of a full treatment. 1. Aqua (purified and deionized water). 2. Bicarbonate of soda is what we use at home for baking and cleaning. 3. Mucuna pruriens extract, made from velvet beans. 4. Sodium carbonate, made from salt and limestone. 5. Ferrous and manganese gluconate are both food supplements used in multi-vitamins. 7. Diatomaceous earth is a naturally occurring sedimentary rock made from ancient deposits of hard-shelled algae. 8. Carbomer is an inert thickener used in shampoos and pharmaceutical products.Pretreatment Ingredients: Aqua, lauryl glucosides, sodium cocoamphoacetate, sodium carbonate, sodium citrate, hydroxypropyl methylcellulose, phenethyl alcohol. *The concentrations of hydrogen peroxide we use are between 1% and 1.5%, a fraction of what one gets in drugstore peroxide. In conventional hair dyes, peroxide is used to break open the hair, and can be up to a 12-15% concentration. When HAIRPRINT is applied to your hair, the peroxide is gone in two minutes. The purpose of a transition is to protect chemically treated hair— whether highlighted, bleached or dyed—from getting into contact with HAIRPRINT. We want to avoid handling it because chemically treated hair is damaged. The internal genetic template inside the cortex, what we call your ‘hair print’, is missing due to the impact of the chemicals. HAIRPRINT infuses the hair with its first pigment, eumelanin. The hair arranges the pigment using this internal structure. That structure determines how light refracts, and the way light refracts determines how we see colour. Damaged hair cannot do this. When applied to damaged hair, your hair may turn darker, or you may experience more dryness or brittleness due to preexisting damage. We recommend starting the transition process when you have at least 1-2” of new growth that is not chemically treated. Directions: After thoroughly washing with the Pretreatment, cover all of the dye or chemically treated and damaged hair with a coating that will not come off during the application. We highly recommend shea butter. Do not use oils. Apply HAIRPRINT as instructed to the uncoated areas. You may need to reapply this coating between steps of the application process. Take care to avoid getting layers onto the hair you are applying HAIRPRINT to. For those with longer hair, you may need assistance from a hair colouring professional or a highly skilled family member/friend to transition to HAIRPRINT. If you make a change now, your hair will be much healthier long into your life.